Having Trouble Grabbing your Learner's Attention? Try Gamification! Did you know that the world is increasingly suffering from a chronic case of attention-deficit disorder (Conversionxl, 2016)? Attention – yours and mine along with the rest of the world is becomingly increasingly limited (Conversionxl, 2016). We are immersed in a whirlwind of text messages, emails, work and family responsibilities and all whilst trying to fit in a social life. So when it comes to eLearning how can we grab our learner’s attention and pull them away from the overwhelming number of stimuli around them. Applying gamification techniques to eLearning can be a great way to tap into our natural desires and motivators. Whether you know it or not it is highly likely that you have experienced the tempting and often addictive pull of gamification.The Candy Crush phase is a prime example of the attention-grabbing and rewarding experience that users can obtain from a game. Candy Crush is so irresistible and attention-grabbing that it is said that its players have left their children stranded at school, abandoned housework and even experienced injuries as they tried to reach new levels of the game (crazy right!?) (Time, 2013). It would make sense to want to replicate this experience of immersion into eLearning. It is so highly important to hold your learner’s interest throughout an eLearning course (Gutierrez, 2012). The last thing you want is an eLearning course that can be described as a ‘page-turner’, where learners merely read through screens of heavy text (and rely on the trusty ‘next button’ to end the misery). Whilst flicking through text on a screen may seem mundane, chances are, most of you on the other hand enjoy games in some way or another (Certificationgame, 2015). Whether it’s playing Playstation, a sport on the weekend or becoming immersed in the McDonalds Monopoly scheme, we have all been there. If you can imagine that game immersion experience and combine that with learning through an eLearning module you can imagine the increase in retention of learning outcomes. So how can you incorporate gamification into your eLearning? It is important to note that gamification is not about turning eLearning into a game but it is rather applying game mechanics to an eLearning module with the intent of creating a similar experience (Gutierrez, 2015). I would love to share with you the mechanics behind gamification that tap into our intrinsic and extrinsic motivational drives (I have also thrown in a few visual examples so you can see what is possible). Explicit and frequent feedback is important in eLearning design (AgileGamification, 2014). Encourage the learner to continue or adjust their actions with onscreen feedback messages. This can also involve congratulating the learner for reaching a goal, encouraging the next action and promoting a new reward (Bunchball, 2015). 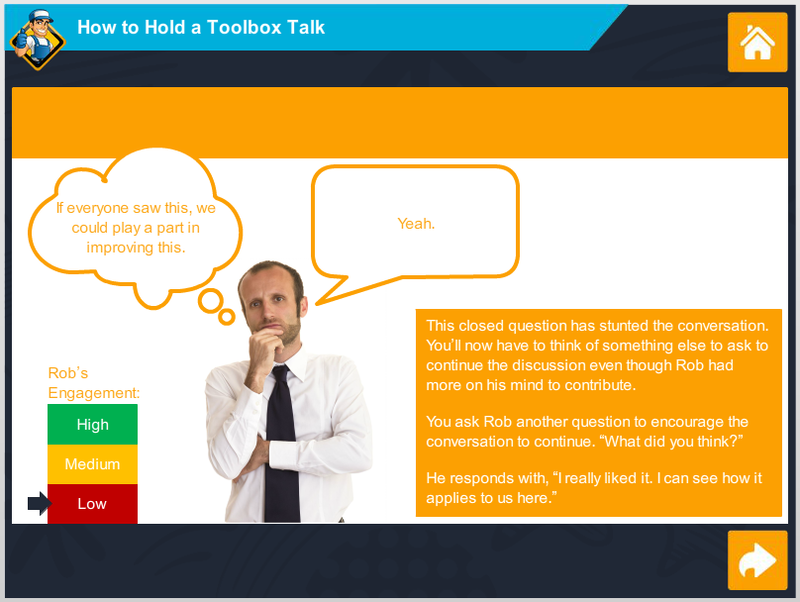 An example from a conversation module that we built that shares the feedback prompts based on your use of open-ended or closed questioning techniques. Show the learner a gauge of their performance throughout the eLearning. Players often want to know where they stand in relation to their peers and/or the requirements of the game (Agilegamification, 2014). This can involve showing progress in real time, allowing the learner to see where they sit on the leader board in comparison to others as well as an overall ranking on any number of metrics (Bunchball, 2015). Courtesy of Muzli. They have great ideas of UI scoreboards, which we recommend you take a look at https://medium.muz.li/leaderboard-ui-inspiration-3a511309b07c. Challenges give learners a purpose for their interaction. The learner should be made aware of exactly what they are needing to achieve within the eLearning (eLearningindustry, 2014). A challenge could be from achieving a score of 80% to keeping a customer happy through selecting the correct responses in a scenario, the possibilities are endless. The goals of the module should link to the learning outcomes. An example of some goals that need to be completed to achieve a quest from an induction training solution we created. When a learner completes a certain skill they can be awarded a badge. A badge is an additional way for the user to be connected with the content they are learning (Learndash, 2013) and feel a sense of achievement in the process. An example of a badge is the ‘Hiking Boot Badge’ which is awarded to FitBit users when they reach 35,000 steps (Fitbit, 2017). An example of points and a badge achieved for demonstrating the company's values, as part of an induction module that we created. When a learner goes up a level in a game it can indicate for them long-term and sustained achievement (Bunchball, 2015). It is also a great way for the learner to see how they are gaining new skills and confidence by achieving the next level through implementing new approaches to previous failures e.g. this can be literal levels or this can look like a basic introduction to a task with information, then the next level is to practice the task with some information, and the last level is to apply the gained knowledge to a task with no support. Onboarding uses a combination of the above discussed points to give reinforcement that the learner is doing well and progressing to build competence. Games often train you in playing the game as you go (users learn by doing) (Bunchball, 2015). It is important to make the first missions/levels simple enough for the learner to be engaged and not be stuck on an overly difficult task (which results in loss of interest). Points are used to encourage your learner to complete certain things by collecting them. It is likely that the learner will work harder towards their assigned challenge in the hope that they will receive more points (Agilegamification, 2014). So now that you know the secrets behind gamification, why don’t you create the next Candy Crush in your organisation? Create the perfect partnership of gaming with your desired learning outcomes and watch as your learners experience the attention-grabbing pull of gamification. Here at Belvista Studios we pride ourselves on delivering interactive and engaging eLearning. If you would like to explore the possibilities of incorporating gamification into your eLearning, partner with us to create something awesome! Visit our website at http://www.belvistastudios.com to find out more! "I am Hannah and I am passionate about how we can create effective and fun learning experiences. I believe that if you create enjoyment and social connection through learning, learning outcomes can sky rocket! The world is changing and becoming more and more digital by the day. We need to harness this and see what's possible!". Gutierrez, K. (2015). Shiftelearningcom. Retrieved 30 October, 2016, from http://info.shiftelearning.com/blog/before-gamifying-elearning-read-this. Muzli. (2016). Retrieved from https://medium.muz.li/leaderboard-ui-inspiration-3a511309b07c. How Realistic is Your Learning Solution?